Imagine you have a topic that is boring to most people. Imagine you have talk for 18 minutes on this topic. Think of a boring topic. How about education? That's pretty boring. If you spoke about education and your audience did not doze off, you would consider it a success. Let me ask you a question. Do you know which is the most watched TED talk ever? Ignore the speaker. Can you guess the topic? Science? Technology? Sports? Movies? Here is the surprise: Sir Ken Robinson delivered a talk in 2006. This video today has more than 20 million views on TED. It is the most watched TED talk ever. And Sir Ken Robinson talked about Education. Let us look at the breakup of his 19 minute talk. But before that, if you have not heard him speak, come out of your wilderness and watch him speak. If you have heard him before, skip to the structure of this talk below. Let me share the gist of his talk here. Introduction: In his 3 minute introduction, he makes the audience laugh three times. He then makes his case. The central argument. Creativity is as important as literacy. This statement uses an analogy and it also pretty shocking. We never thought we should treat creativity with the same respect as literacy. Part 1 (All children are creative): In these 3 minutes he make us laugh three times again. 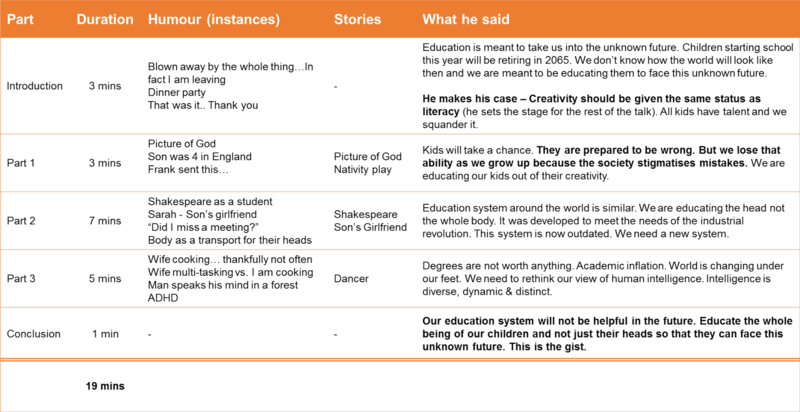 He shares two stories as well (nativity play and the picture of God). He makes a strong argument that all children are born creative. Our education system is making them less creative as they grow up. 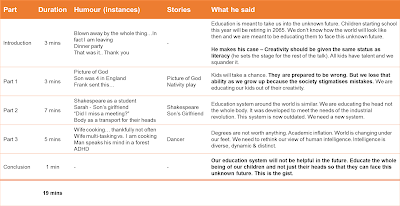 Part 2 (Education system around the world): Here the speaker goes about explaining how every education system in the world is structured and why it is flawed. In these 7 minutes, we laugh four more times and there are two more stories. Part 3 (We need to change right now): In these 5 minutes we are made to laugh four more times and we hear the most important story of all; the dancer's story. He makes his case strongly by saying, we are going through academic inflation. Degrees are not worth anything. Conclusion: He concludes in just one minute and he summarizes very nicely. Overall there are at least 14 instances where we laugh out loud and there are 5 stories. All this in just 19 minutes. How many did you say in your last 19 minute talk? 1 or none? All of us can learn from this master. The bottom line: He makes a boring topic interesting by doing 4 things. 1) His argument is powerful and backed by a lot of thinking and knowledge. It is also relevant to all of us. It appeals to everyone of us. 2) He has used humor to his advantage. The entire talk is garnished very well with humor. By making us laugh once in a while, he manages to retain our attention. No one can listen to a lecture of 19 minutes otherwise. 3) He uses a lot of stories. While some stories are just to make us laugh, the others have important messages. The dancer's story is inspiring and it is in a way the crux of all that the speaker has to say. The stories are memorable (as most stories are) and help us remember the message for a very long time. 4) The talk is structured well and the content is very less. While he speaks for 19 minutes, he does not talk only about education. My guess is, he speaks only 50% of the time on the topic. The balance 50% of the time is spent on humor and stories. Humor gives people a break and stories help him make his point memorable and tangible. The story of the dancer helps us understand what the author it talking about. What is the gist of his entire talk.